Jodi Bean's Blog: And The Winner Is. . .
AND since Katie was already a reader of my blog and therefore not sure who "sent" her I picked a 2nd winner. 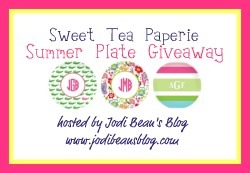 . .
Amanda from Sweet Tea Paperie will be contacting you guys about claiming your plates! I'm jealous!!! Thanks everyone for entering my giveaway. I hope to do another one very soon. THANK you 1mill times over again for having such an awesome giveaway!